Calling on all art lovers… a play about the Love/Hate relationship between a man and woman Performing Arts Workshop and Studios (PAWS) in collaboration with TerraKulture will brings to you, ‘Oh How Dearly I Detest Thee‘. Featuring different talented actors, the play is a must watch for every couple and intending couple. 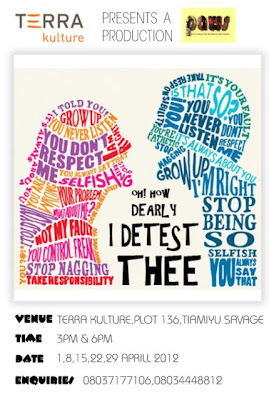 The stage play ‘Oh How Dearly I Detest Thee‘ will be showing every Sunday at TerraKulture at 3pm and 6pm. The play is written by Jane Ngo and directed by Kenneth Uphopho. Starring Eyiyemi Rogbinyin, Kenneth Uphopho,Paul Alumona, Seun Kenetebe, this is a play that shouldn’t be missed.